Do you want your bee problem in Bonsall solved permanently? Look no further than D-Tek Live Bee Removal. We are a local San Diego bee removal company based out of Vista and we specialize in live bee removal and bee control services in Bonsall. With the honey bee population dwindling it is vital that any bee control company perform only live bee removal. After we have safely vacuumed up all of the honey bees we transfer them to a bee hive box. From there we drop them off to one of our San Diego beekeepers. By choosing D-Tek Live Bee Removal for your Bonsall bee problem you can be assured it will be done correctly the first time. While all the above steps are very important there are two that are critical to perform. The main concern is a complete extraction of all the bee hive during the bee removal process. Bees have an excellent sense of smell. If any bee hive is left in the structure it will attract other honey bees for years to come. There are plenty of bee removal companies in San Diego County that will come to your home and simply exterminate the honey bees leaving the bee hive in the structure. 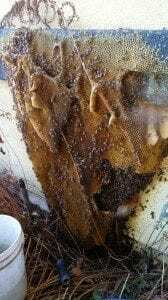 Once there are no honey bees there to tend the bee hive all of the honey will melt out and can damage stucco, drywall, framing, electrical wiring, etc. It will also attract other common house hold pests such as ants, mice, rats, etc. It is more costly up front to have a complete and proper bee removal. However in the long run it will save you time, money, and frustration. An equally important aspect of your Bonsall bee removal process is the bee removal repair work. It is often times necessary to cut into the roof, stucco, or drywall to completely remove all of the honey bees and the bee hive. Properly repairing the roof and stucco is critical. All of our technicians at D-Tek Live Bee Removal have extensive construction repair experience. We also guarantee our repairs to be free of defects and guarantee our roof and stucco patches to not leak. Our drywall patches are guaranteed to blend seamlessly with the surrounding area. D-Tek Live Bee Removal is fully insured. We provide a copy of this to you the customer with every written estimate. We also offer free estimates and inspections. Our bee control service in Bonsall is superb. After each live bee removal and the accompanying repair work is completed we then bee proof the areas the honey bees were entering and exiting from. We in the industry call this bee control. Every bee removal we perform comes with this service. We bee proof in a 10 foot radius from the original entry and exit point the infestation occurred from. We also offer whole house bee control service in Bonsall. We will check every crack, crevice, vent, etc and make sure they are properly bee proofed so you don’t ever have a bee problem again! We have many beekeepers across San Diego County, Riverside County, and Orange County. For bee removals in Bonsall our usual drop off location is to the beekeeper in Temecula wine country. There is no shortage of pollination for the honey bees that’s for sure! Our secondary drop off location is to a beekeeper in Encinitas. He uses the honey bees for pollination and scientific research. The owner’s direct line is 760-224-3040. Call any time day or night regarding your bee hive removal problem or questions. Don’t feel like giving us a ring? Simply fill out our bee removal contact form and we will call you back ASAP regarding your bee problem in Bonsall. We can usually service Bonsall same day and have you bee free in no time.